It's been less than 24 hours since I've released PSBlackListChecker with support, among other improvements, for Microsoft Teams and Slack and I'm now adding Discord to the mix. 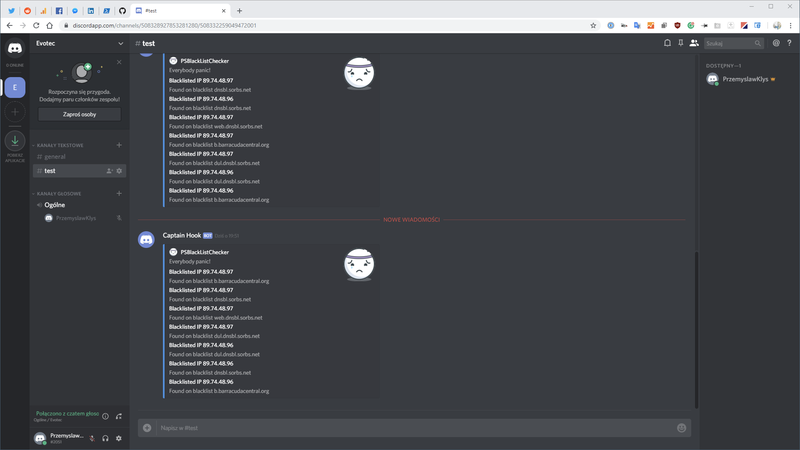 Discord was a popular request (well not really, just one person asked, but let's pretend everyone loves PSBlackListChecker so much that they are too shy to ask for feature requests!). Please notice this article contains parts of information (still useful) and may not reflect all functionalities of this module. For download, source code and so on you should refer to the dedicated PSBlackListChecker module page. After reading this one of course! It contains useful information, examples, and know-how. Without it, you may not know all the features. There is merely a new section that shows up in the config file, and you will also have to do one little step of installing a module from PowerShellGallery. If you're interested in Microsoft Teams or Slack, please visit PSBlackListChecker – Notifications to Microsoft Teams, Slack 0f Blacklisted IPs for more information. To be able to use Discord with PSBlackListChecker you need to install an additional module from PowerShellGallery. This module is open source (sources available on GitHub) and released by Mike Roberts. He was also so kind to add support for PowerShell 5.1 so we can enjoy this great module.